AIR WALLET, a real fiat-backed currency wallet platform, announced on Tuesday that it has established a subsidiary in Estonia. As a result, the possibility of supporting Euros (EU), as well as Won (KRW) and Cipher, on AIR WALLET’s platform has significantly increased. In the coming months, AIR WALLET will be working hard to expand globally for the convenience of their global user base. This will allow for safe storing and managing of fiat currencies in addition to the cryptocurrencies already supported. This development is seen as a huge first step in the effort to start cryptocurrency utilization on a mass global scale, lowering the barriers that have kept traditional fiat holders from entering the cryptocurrency market. 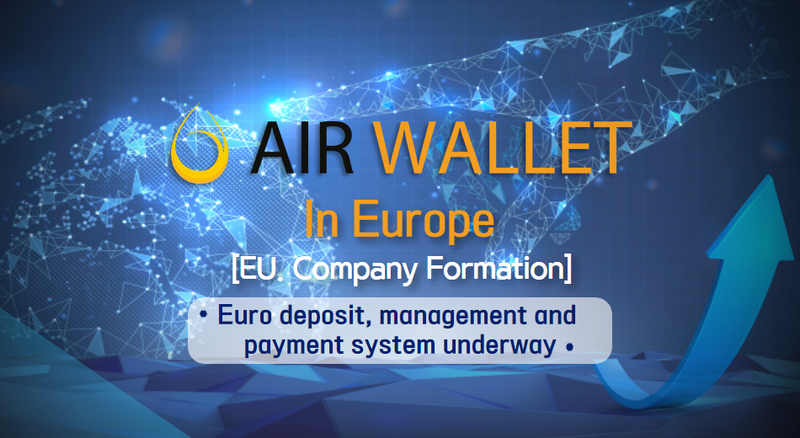 Though many other blockchain and cryptocurrency companies are developing new uses for cryptocurrency, AIR WALLET is truly the first of its kind. The amount of possibilities that are being built into this unique platform will create a revolutionary new way to manage and use both fiat and cryptocurrency no matter where in the world the user is located or what their preferred currency is to use. Incentivizing users as well as companies to join and use different currencies within the platform helps to create an ecosystem where organizations and individuals alike can benefit from each other, harnessing the true spirit of blockchain and a decentralized economy. “We continue to work and collaborate with our recently established Estonia branch to focus on making the AIR WALLET platform more popular and robust.” said Lee.